Gender is one of the points of contention between Iran and the West. Iran is perceived as a patriarchal society that oppresses the rights of women. Women are rarely seen on the political stage, cannot sing in public and must wear the hijab. The treatment of women has been one of the main barriers for engaging with Iran. But visitors who travel to Iran are often struck by the forthrightness of women. Many do not hold back from presenting their points of view. Outside Iran, this has become evident with women graphic artists. 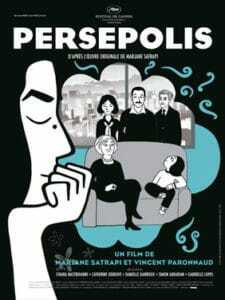 Marjane Satrapi’s Persepolis offered an accessible “comic book” account of the Islamic revolution from a young girl’s perspective. It’s simple black and white palette was transformed into an animation which won the 2007 Jury Prize at the Cannes Film Festival. While the Persian Prospect offers some beguiling ways of engaging with the sumptuous traditional crafts of Iran, there are also new art forms that reflect the life of daughters in the modern world. This is potentially a rich mode of connection with the personable soft crafts that are thriving in Western cities. In Australia, young female film directors from are already making a mark such as Granaz Moussavi’s My Tehran for Sale (2009) and recently Nora Niasari’s short films. The Persian Film Festival will soon feature Nahid by the upcoming female director, Ida Panhandeh. This just one more glimpse of the contribution that Iranian artists can make to other cultures now sanctions are lifting.